This section discusses data from public opinion polls. Such data reveals what American adults say that they believe. This sometimes differs from what they actually believeand/or from their faith group's teachings. These essays are based on the results of the Baylor Religion Survey which found that most Americans have one of four views about God: as being either either an Authoritarian, Benevolant, Critical, or Distant God. U.S. Polling data: Beliefs about life after death. About ghosts, salvation, Satan, Heaven, Hell, Astrology, and the literal accuracy of some biblical stories. Divisions among Protestant denominations There are at least two types of Protestants. Differences between Roman Catholicism and conservative Protestantism There are major gaps; and they are growing. 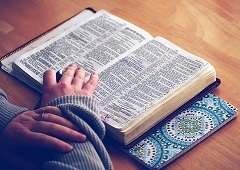 How Christians interpret the Bible Their beliefs differ because of how they view the Bible.